Former Gov. George Ryan scolds Dave McKinney for a September 2000 story he didn't like during an appearance at the Old State Capitol in Springfield. In recent memory, few people were better qualified to be Illinois governor than the one-time pharmacist from Kankakee. A Republican, Ryan rose in the Legislature to become House speaker, served two terms as lieutenant governor under former Gov. James Thompson and won two other statewide races for secretary of state before running for governor in 1998. 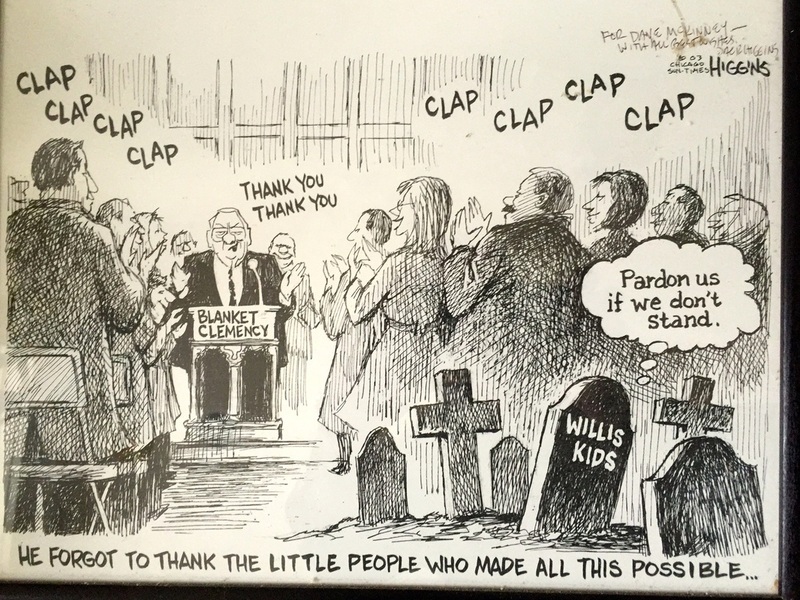 I covered Ryan's rise to the state's top political office and his fall under the weight of a federal investigation -- a case that stemmed from a trucker getting his commercial drivers license illegally during Ryan's watch as secretary of state, then going on to cause a 1994 crash that killed six Chicago-area children. Ultimately, Ryan was convicted of conspiracy, racketeering, money-laundering and fraud by a federal jury and sentenced to six-and-a-half years in federal prison. Before scandal ended his political career, he had a love for the flourish. 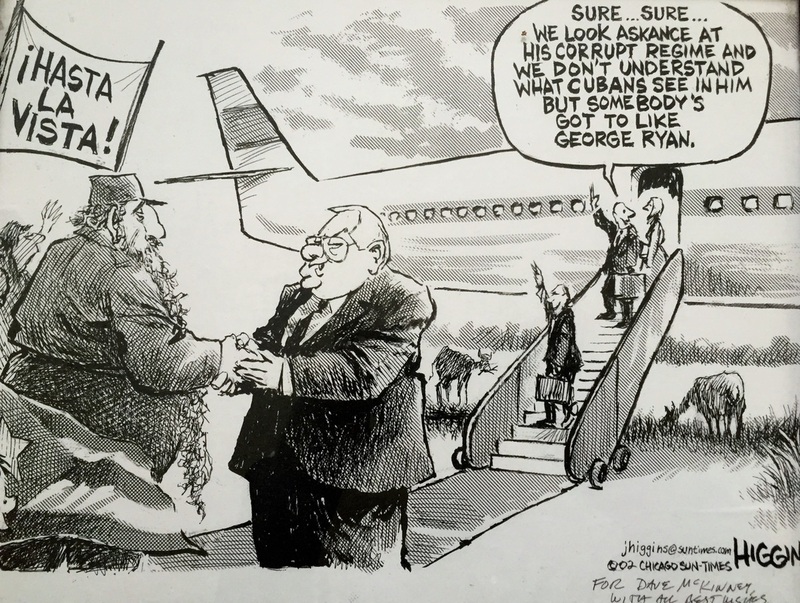 He organized a trip to Cuba that involved a meeting with Fidel Castro, which I covered for the Sun-Times. Ryan managed to win most of his legislative battles except for a push for tighter gun control, a loss he would blame partly on the absence of a state senator who would go on to become president, Barack Obama. While Ryan allowed a convicted serial killer to be put to death in the state's last execution, which I witnessed, the former governor cleared death row by commuting the death sentences of more than 160 inmates to life in prison. The move put him in the discussion for the Nobel Peace Prize, but he didn't win the award despite drawing praise from Nelson Mandela and Pope John Paul II. Ryan also had a one-of-a-kind way of dealing with the reporters who covered him. He could be blustery and profane. He cracked jokes and could be playful. But in the end, he just quit responding as the federal racketeering and fraud investigation crept closer to him. On one occasion early in his term, I posed a question to Ryan during a scrum, and the then-governor turned and said he wouldn't answer. I asked why, and Ryan said, "Because you're ugly." No sooner had I returned to his statehouse office, and the phone rang. His executive secretary on the other end said, "Please hold. I have Gov. Ryan on the line." Moments later, Ryan picked up. "McKinney," he said. "I didn't mean to call you ugly." I wasn't offended in the first place. But our detente was short-lived. Another time, the governor dressed me down with the statehouse press corps barely out of earshot over a story he didn't like. The piece quoted an unnamed source who asked for anonymity to avoid incurring Ryan's wrath. I defended the story, but Ryan persisted. At one point, Ryan asked me bluntly if someone anonymously called him a "c---------," would I print that? I answered that if three people saw him doing it, I would, which drew a harrumph from him before ending the conversation. A photographer for the governor's office captured the exchange in the picture above and slipped me a copy as a souvenir. As his political and legal problems mounted, Ryan took on the persona of "Governor Grumpy," a moniker headline writers at the Sun-Times later attached to him for a front-page analysis I did. The piece came after he'd lashed out against two Republican candidates for statewide office in 2002, his one-time running mate, the press and even the task of marching in parades. More recently, with his prison term finished, any tension that existed between us seemed to have dissipated. Ryan was cooperative and generous of his time as I researched a freelance piece for the March 2015 issue of Chicago Magazine. Ryan's input on the likelihood of Gov. Bruce Rauner getting along with House Speaker Michael Madigan is included on the page of this website devoted to the speaker. Former Gov. 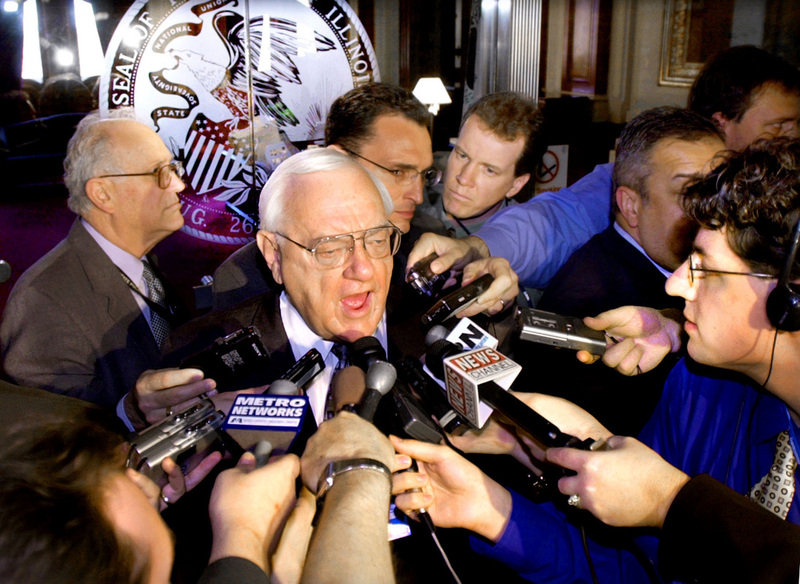 George Ryan mixes it up with me after a 1999 news conference. During Ryan's trip to Cuba, Fidel Castro staged a press conference for Illinois' press corps at Havana University. In this picture taken by St. Louis Post-Dispatch reporter Kevin McDermott, I'm the one whom Castro is touching on the shoulder. In this Associated Press photo, Ryan takes questions about budget deliberations as I hovered over his left shoulder.